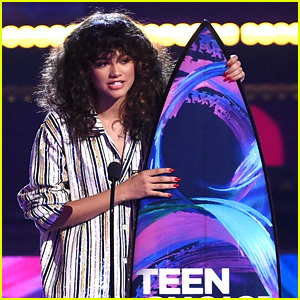 Zendaya won the award for Choice Summer Movie Actress at the 2017 Teen Choice Awards and she gave an important and inspiring speech amid the events in Charlottesville. The 20-year-old entertainer told her fans how they are the future leaders of the world and it’s necessary for young people to be educated and to pay attention to what’s happening out there. “With all the injustice and the hatred and everything that is happening not only in the world, but in our country right now, I need all you young people, I need all you guys to be educated, I need you to listen, I need you to pay attention,” Zendaya said. Zendaya was one of the many stars who spoke out after the injustices in Virginia. 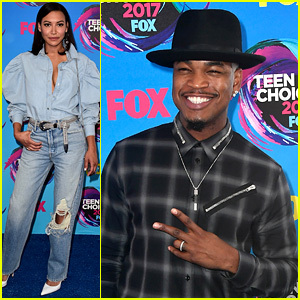 Naya Rivera and Ne-Yo walk the carpet at the 2017 Teen Choice Awards held at USC’s Galen Center on Sunday (August 13) in Los Angeles. The two stars are set to star in the upcoming YouTube Red series Step Up: High Water, which will consist of 10 episodes for the upcoming first season. The show is currently in production in Atlanta. FYI: Naya is wearing a Marques Almeida blouse, GRLFND denim, a B-low the Belt belt, Gianvito Rossi shoes, and Mounser earrings. The ladies of Fifth Harmony are having a great time at the 2017 Teen Choice Awards! 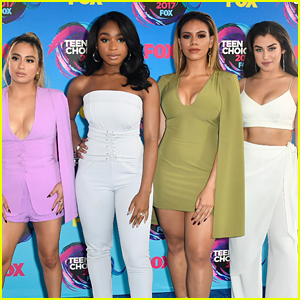 Singers – Ally Brooke, Normani Kordei, Dinah Jane, and Lauren Jauregui – won the awards for Choice Music Group, Choice Summer Group, and Choice Song: Group for the their hot new song “Down”! In case you missed it, Fifth Harmony released the music video for their new single “Angel” earlier this weekend. 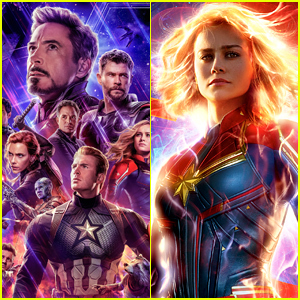 Check out the full list of nominations for tonight’s Teen Choice Awards here! FYI: Ally is wearing a Lavish Alice outfit, Steve Madden shoes, Swarovski rings, Vida Fede earrings, with a Jen Atkin x Chloe and Isabel hairpiece. Dinah is wearing a Lavish Alice outfit, Aldo shoes, with Vida Fede jewelry. Normani is wearing a Lavish Alice outfit, Thom Solo shoes, with Effy and Graziela rings. Lauren is wearing a Lavish Alice outfit, Giuseppe Zanotti shoes, Effy rings, with Vita Fede earrings as she carries a Jimmy Choo clutch. 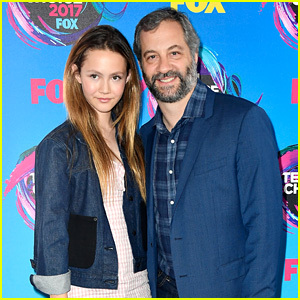 Judd Apatow hits the red carpet with his daughter Iris at the 2017 Teen Choice Awards held at USC’s Galen Center on Sunday (August 13) in Los Angeles. Iris, who is also the daughter of Leslie Mann, is looking all grown up at age 14! You probably recognize Iris from her work in Judd‘s movies like Knocked Up, Funny People, and This Is 40. She has also been seen in the Netflix series Love. Make sure to go see Judd‘s latest movie The Big Sick, which is currently playing in theaters everywhere. Bella Thorne rocked glittery rainbow makeup at the 2017 Teen Choice Awards and we’re OBSESSED. The 19-year-old Famous in Love actress hit the blue carpet at the event held at USC’s Galen Center on Sunday (August 13) in Los Angeles. Bella styled her pink locks into curls and sported rainbow-colored eye makeup along with splashes of rainbow glitter on her body. She brought her pup along as her date! “Vote for me for #ChoiceSnapchatter @TeenChoiceFOX,” Bella captioned the Twitter pic below. Bella is also up for Choice Summer Movie Actress for Amityville: The Awakening and Choice Drama TV Actress for Famous in Love. 'Pretty Little Liars' Stars Win Big at Show's Last Teen Choice Awards! Janel Parrish and Lucy Hale are surprised with their awards while presenting on stage at the 2017 Teen Choice Awards held at USC’s Galen Center on Sunday (August 13) in Los Angeles. The ladies and Pretty Little Liars co-stars were presenting on stage when host Logan Paul popped up to surprise them with the news that they both won awards! Lucy won the award for Choice Drama TV Actress and Janel won for Choice TV Villain. This was the final time the show is eligible for awards at this show. FYI: Lucy is wearing a Fausto Puglisi dress, Stuart Weitzman shoes, a Jimmy Choo clutch, and Beladora, Shay, and Ileana Makri jewelry. Janel is wearing a Hamel dress.